We’ve spent the last few months perfecting a new marketing piece for our good friends at the San Antonio Hispanic Chamber of Commerce. This brochure was created for prospective members, both small businesses and large corporations, to inform them of the benefits of becoming a member of the Hispanic Chamber. The SAHCC was the first organization of its kind in the US and continues to be one of the best-run chambers in the country, recently being awarded a 5-star accreditation by the US Chamber of Commerce in 2014. The catalog showcases the Chamber’s value through opportunities, events, and the massive network of businesses and individuals they carry. It highlights various notable members, showcasing their success stories, and shows potential new members all areas of involvement so that they can find the elements that interest them most. 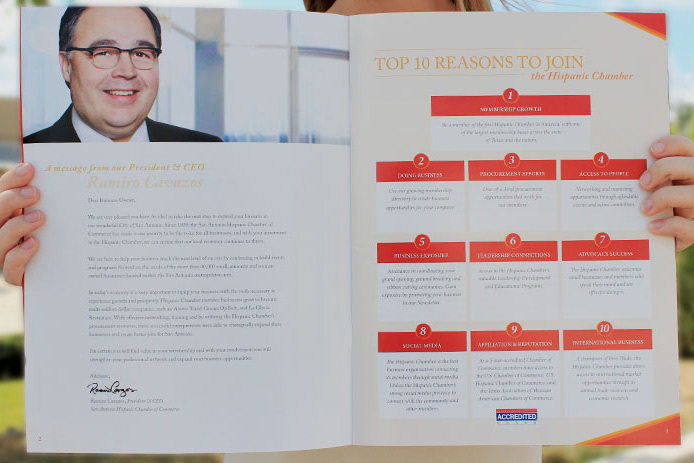 Like us, the Hispanic Chamber is extremely proud of their new membership packets. They now have an amazing tool to give to their prospective members and bring more attention to the amazing organization they have created.